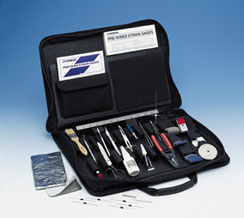 We have put together this kit using the type of tools and products that a strain gauge manufacturer or a strain gauge designer would use when applying strain gauges. A descriptive instruction sheet is included giving step by step details on how to prepare material and apply strain gauges. 4 Digit Indicator with Wheatstone Bridge Input. Excitation Voltage included.